I loved this recipe and will definitely make it again. I feel that it called for too much shrimp- I would use 1/2 lb less than what’s called for. I would make up for this with more peas and add another 1/2 cup! Yummy!! Easy And great for lunches during the weeke. How do you defrost your shrimp? Gina. I’d like to use cauliflower rice. Any tips on how to make it fast a little less like cauliflower, and a little more like rice? Is the listing of 1000mg for sodium correct? It seems high to me. Such a simple and easy dinner – I love it! And who could say no to some tasty fried shrimps. Yum! Made this tonight after seeing your IG post! It’s delicious! But I have to be honest, I freaked out at first with the rice, it wasn’t cooked through and didn’t seem like it’d be enough. But I left it covered for longer while I made the shrimp and it ended up cooking through and fluffing up quite a bit. I added paprika and cayenne to the shrimp and added saffron threads to the rice. The dish came out a little too dry for our tastes so we topped it with homemade Chilean salsa aka pebre. It was perfect! Very Spanish flavors all around. Will be making this again! Sounds like you used a different rice? If you use regular brown rice it will take longer. Loved this recipe!! I added mushrooms because I love them in almost everything and it worked out fine! Will make again! Has anyone tried this with cauliflower rice? Can ghee be substituted for butter in this recipe?? 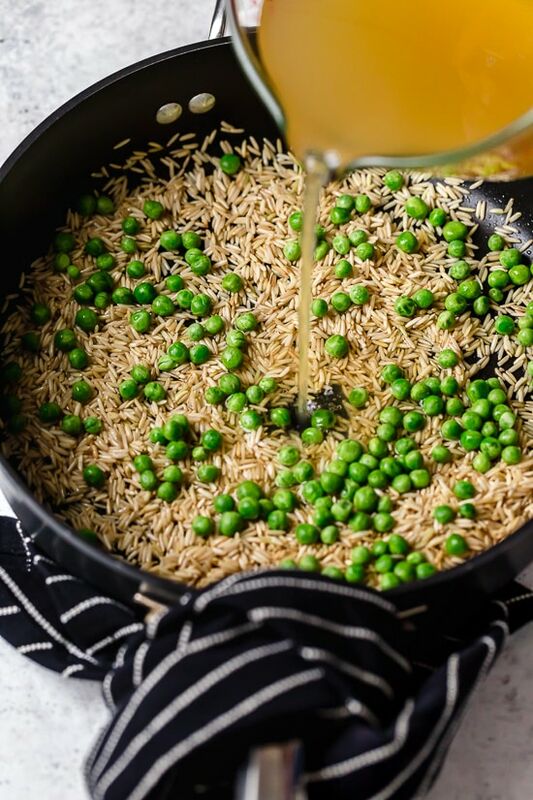 If you want this to be much healthier bump the peas up to 2 cups and cut the rice in half. Made this for dinner tonight, it’s easy, quick and delicious. Served with roasted green beans. It makes a great dinner that’s family approved. My grocery store had frozen shrimp BOGO, so it worked our great. Tried this tonight – LOVED IT! Quick, easy and husband seal of approval! Made this for dinner tonight, the recipe was spot on and delicious! My husband likes a bit of spice so we seasoned the shrimp with Old Bay before sautéing. Two nights in a row have been Skinnytaste recipes! "Add chicken broth and peas and bring to a boil. When all liquid is absorbed reduce heat to low and cover. Cook on low for about 15 minutes, until rice is cooked through." If all the liquid is absorbed before you reduce heat, cover and cook for 15 minutes won't it burn? I just followed the regular recipe for cooking rice, add chicken broth, cover, bring to a boil, turn to low and cook 15 minutes or until liquid is absorbed. I was afraid to add the peas so early so I just added them at the end and they were perfect. Hey Gina I'm just a little confused about the portion size. 1/4 of the dish would be what exactly? Do you mean 1/4 of a cup? Question, maybe be a stupid one, but are you using instant rice? Delicious. I added carrots to the rice, creole seasoning to the shrimp and (after mixing it all together) 2 teaspoons of low-sodium teriyaki. Even better than I expected! Thanks, Gina! What protein can be used as an alternative as I have a family member that is allergic to shellfish? This was such a great recipe! I used basmati rice and seasoned the shrimp with Mrs. Dash instead of salt. Also didn't have any pecorino cheese, so I just used shredded parmesan. 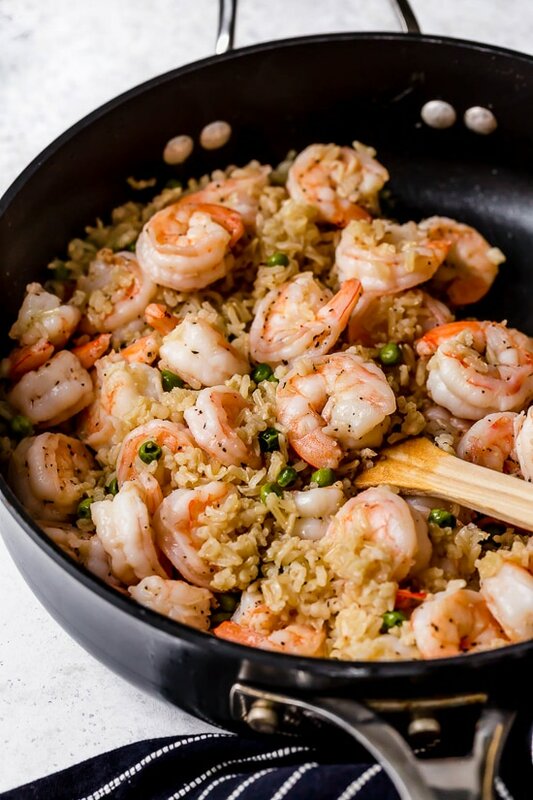 I made the rice in a rice cooker and when it was done just tossed the sauteed shrimp in. So good! This was a great recipe! My husband and I both loved it. The flavor was very nice, it was easy and very satisfying. 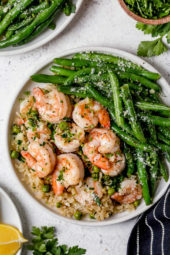 I used pre-cooked shrimp and added sliced green onions with the peas. This could also be done with scallops. Thanks! I don't like peas either, but you don't really taste them. Maybe diced carrots? If you dont like peas do you think I could sub a difrerent veggie? like maybe some garlic and onions?…..I know they dont have nutritional value. I look forward to making this one. Isn't it wonderful! I loved this as a kid!! Of course I'm sure my parents used a lot more oil. Delicious! I made it last week and also this week and it was a real hit with my husband. The little bit of "frying" at the end with the oil and rice added so much flavor, I couldn't believe it. It's so simple, requires minimal ingredients, and is so flavorful. This one is going in my regular rotation for sure! I continue to be impressed by all the recipes I've tried on your site. 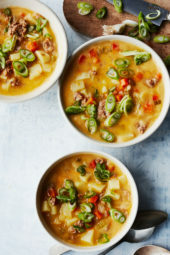 Tried this recipe tonight and loved it so did my husband. We have tried about 4 of your recipes so far and each one has been a hit. You reduce the fat without altering the flavor of the recipes. I know I will be trying more of your recipes. Thanks Gina! Now the old, I will update new points today. Hi Gina … just found about this website and I am thrilled!! So many great recipes and the PPV are already done for me … thank you, thank you, thank you!! I am a lifetime WW member and have been getting bored with the same meals. My husband is going to be very happy too. Is the points value listed here the new points+ ? 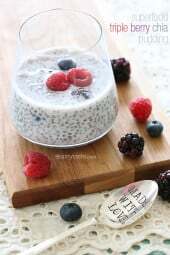 I just made this recipe with quinoa instead of rice – delish! Can't wait to make this! When you have time, would you be able to post the nutritional info or the Points Plus? Thanks! I don't like peas, but I like them here. Glad you enjoyed this, you just put me in the mood for it! Ok, I just made this yesterday for lunch since I didn't know if I would like it, or if others in the family would, so it was a "test run" so-to-speak. My mom & I loved it!! The "different" flavor I noticed, that was also "weird" to me in the cauliflour fritter recipe was the parsley…so I will know to use less of it (although I'm getting used to the flavor) in recipes…So needless to say I just ate this for lunch & wish I could have more now, and I will be making this for dinner soon! 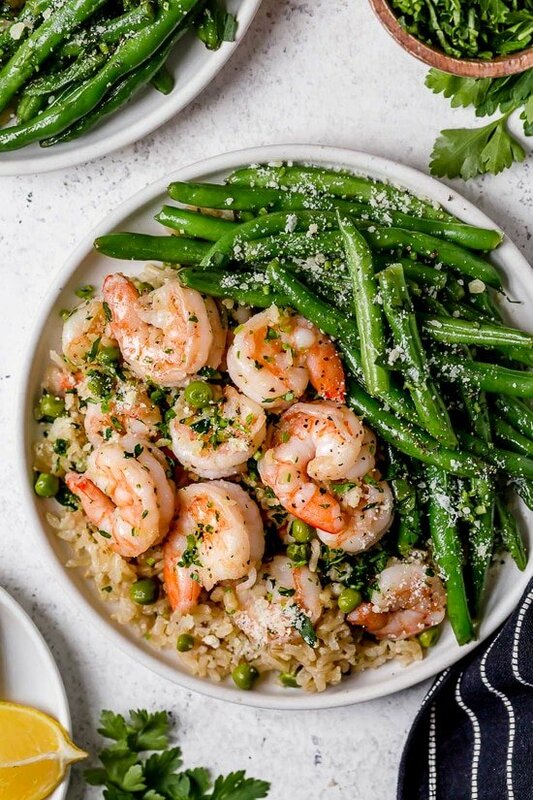 I am not even big on eating green peas but there was just a little/not too much peas =) <3 the shrimp & sticky-rice texture 🙂 It was even better as leftovers!! Yes, raw shrimp. No prob! Is that 1lb of shrimp prior to cooking it? I'm heading to the grocery store right after work to pick up the ingrediants! I know my husband and daughter will love it! Yes, Brown rice takes a lot longer to cook and sometimes needs more water. I like to soak my brown rice for an hour before I cook it, it speeds up the cooking. I used Carolina long grain rice, not converted. I like the idea of adding curry, hope you had success with the brown rice. 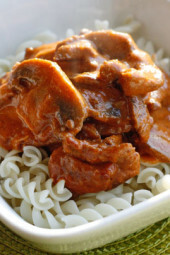 Gina – about to make this with brown rice. Did it once before…turned out a little 'crunchy'!! Should I soak it in water for an hour before cooking? Thanks! I followed this recipe to the "T". I used brown rice and it did not cook well at all. I added more chicken broth and am having to test the rice for doneness before I can continue with the recipe. Does white rice cook better than brown? Would it be better to use Uncle Ben's converted rice? I added 1/2 teasp. of curry and cannot wait until it's done to see what the dish tastes like. I'm making this tonight it looks yummy! 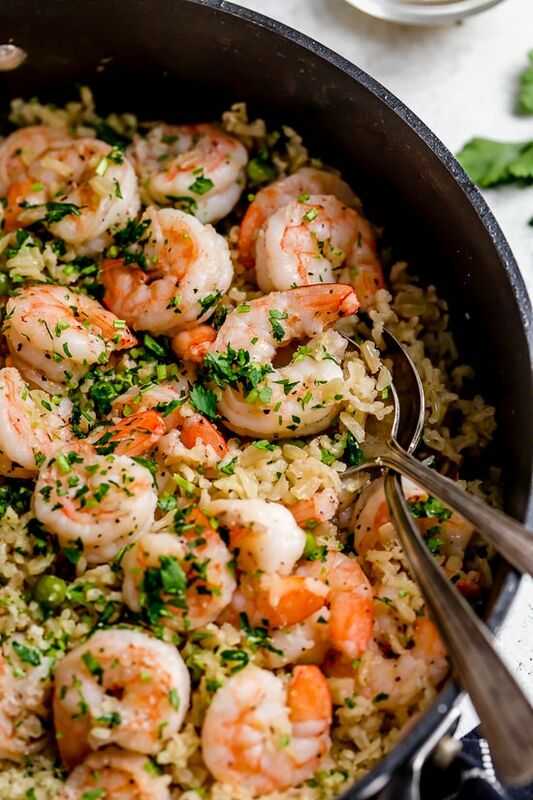 My mouth is watering for shrimp now! Excellent recipe here, no doubt this will be a winner around here. 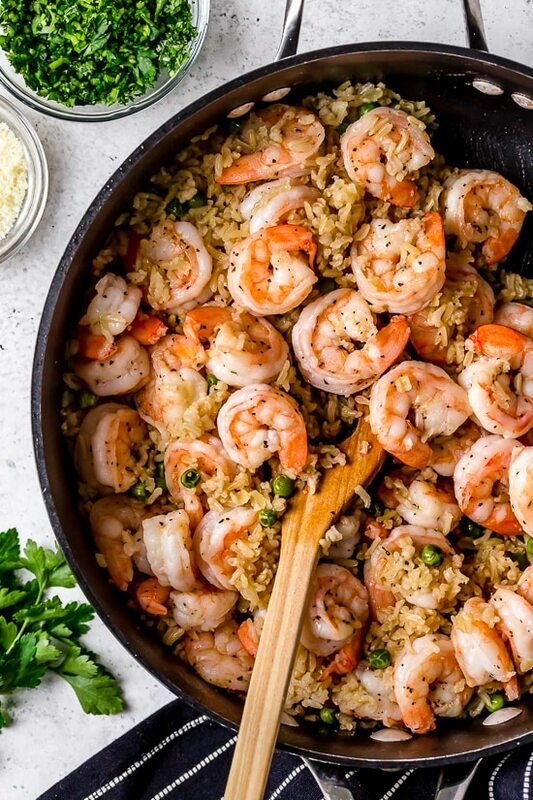 Looks good, Have you ever made it with Brown rice? Would that lower the points? 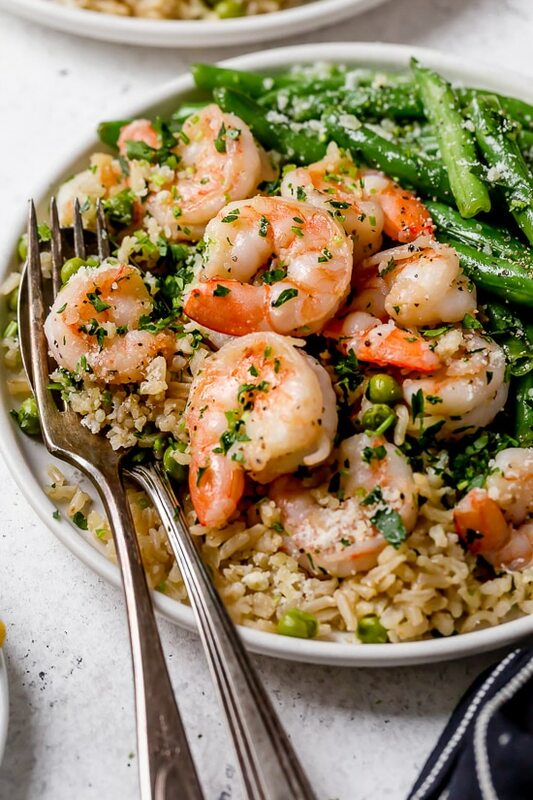 Shrimp is good in anything really. This is like a quick, easy stir fry. mmm, looks so good! I think I will make it next week!